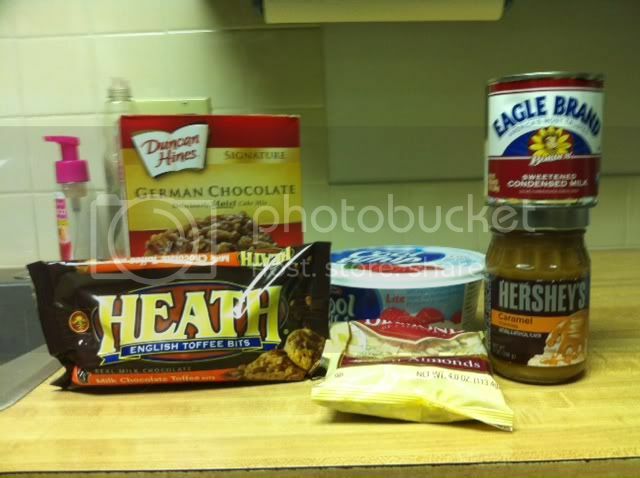 The ingredients German Chocolate cake mix, tub of cool whip, carmel topping, sweetened milk,sliced almonds, and Heath bar pieces. 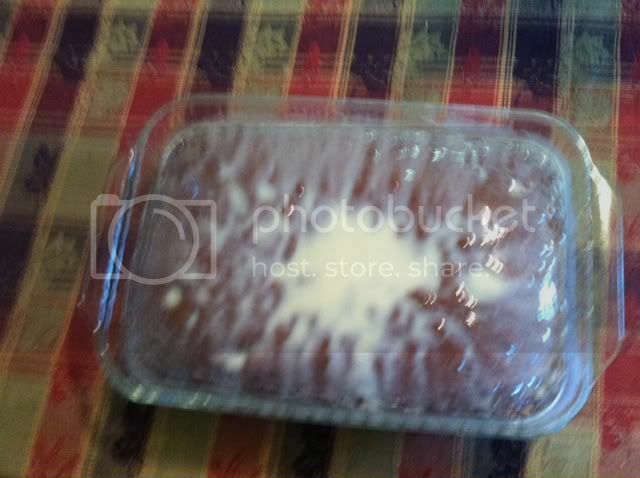 Fix the cake to directions on the box. 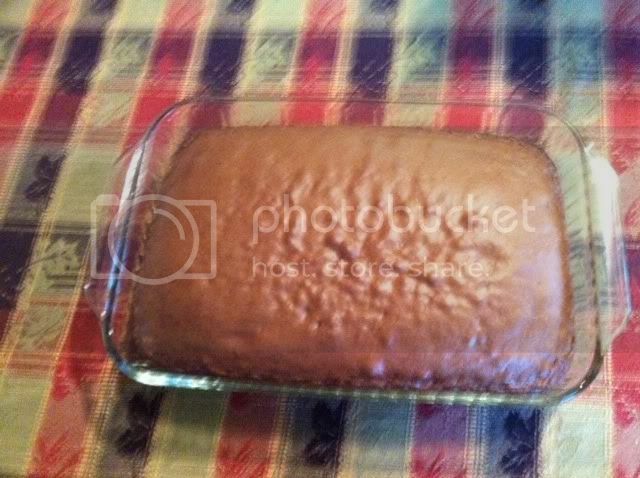 As soon as cake comes out of the oven, put the can of sweetened milk on the cake and spread it out. 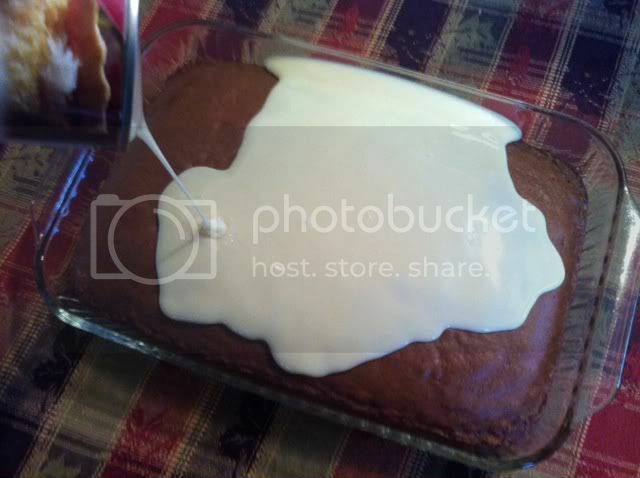 Let the cake cool completely with the sweetened milk. While waiting on the cake to cool and the oven is still on, I toast the almonds real quick. 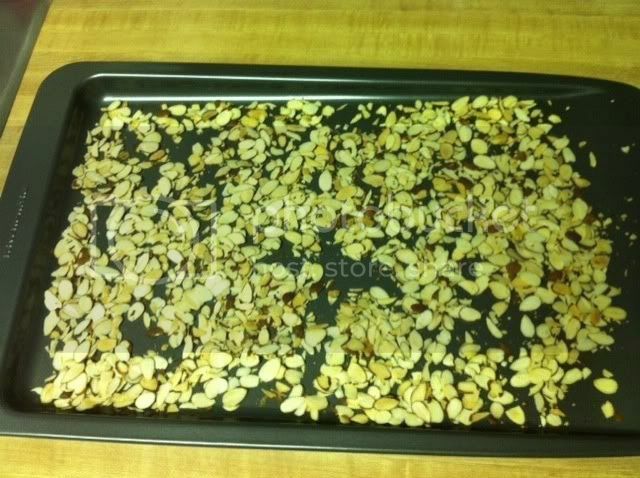 Once the almonds come out of the oven, I put them on a cool cookie sheet. 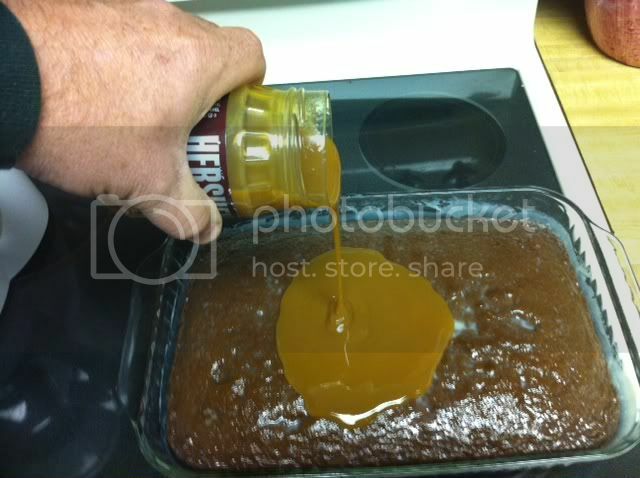 Once cooled, pour entire jar of carmel topping on cake and spread out. Add the cool whip and spread out evenly. 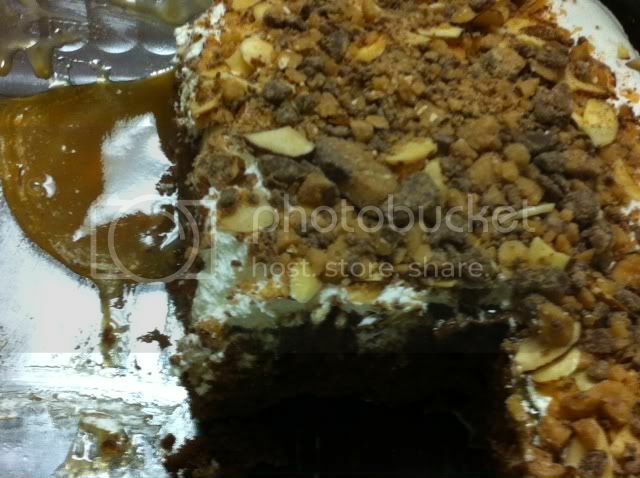 Spread the toasted almonds over the cake evenly. 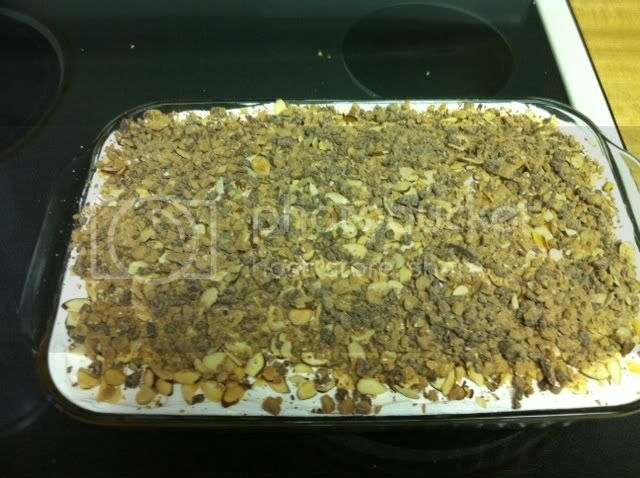 Top the cake with the Heath Bar pieces. Its best then if you can refrigerate the cake an hour or so, it sets up nice and serves well. Make cake according to directions on the box. 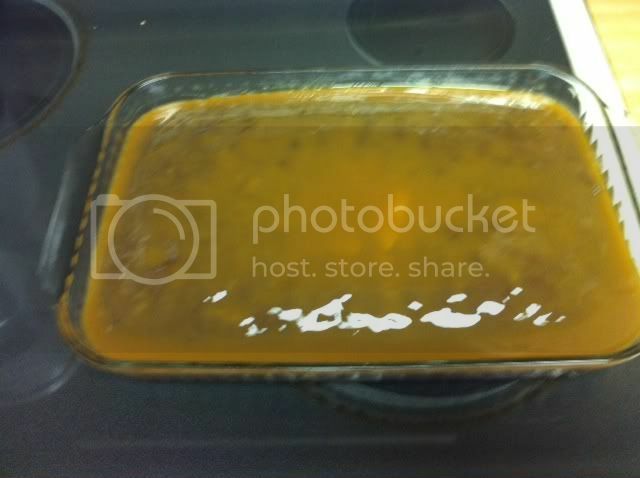 When done, remove from oven and instantly pour Condensed Milk on cake and spread out over entire cake. ALLOW CAKE TO COOL COMPLETELY I usually let it sit up to 3 hours. While cake is cooling, toast almonds in a 350* oven for 5 to 10 minutes. 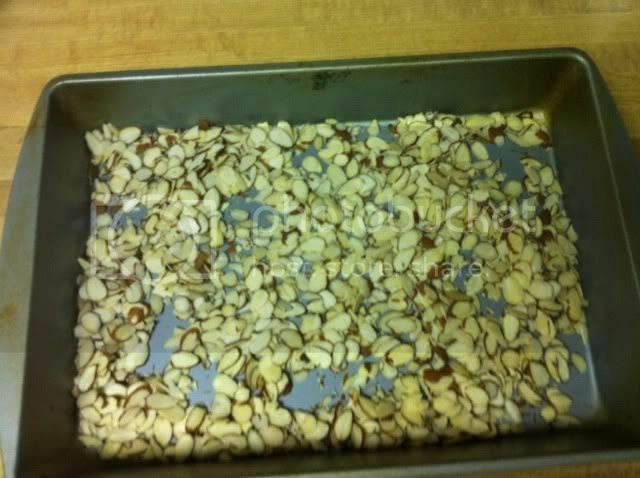 As soon as they come out of the oven, place almonds on a cool cookie sheet to keep them from continuing to roast. 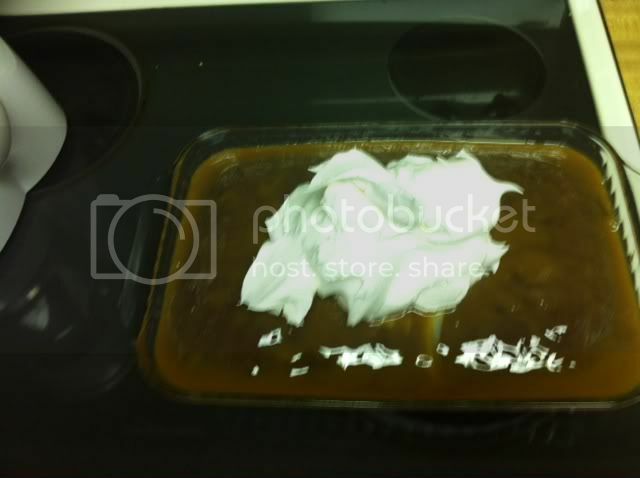 Once cake is completely cool, pour entire jar of Carmel Topping over cake and spread evenly. I warm the jar in the microwave for 15 seconds to pour easier. 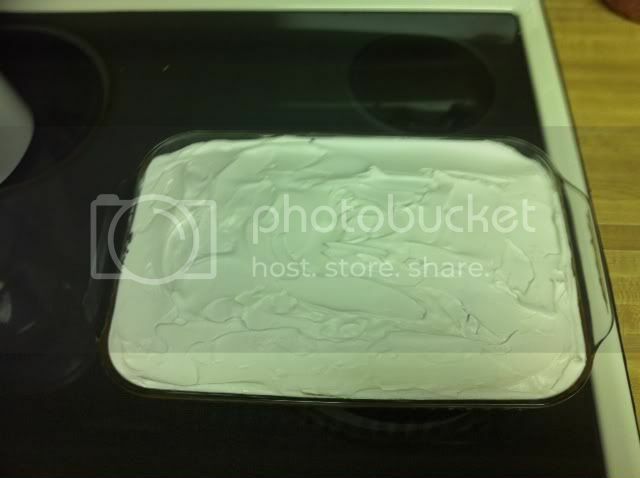 Scoop entire tub of Cool Whip onto cake and spread out evenly. 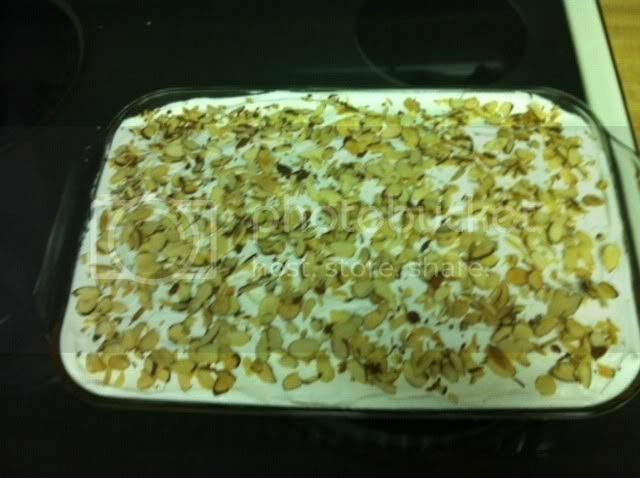 Spread out roasted Almonds evenly over the cake. Spread out Heath Bar pieces out evenly over the cake. I like to chill the cake for 30 mins to an hour before serving to let everything set up and be firm. It serves easier that way, but is not necessary. That looks and sounds great. Another one on the list to try. Dang Troy, I leave town and you turn into Betty Crocker, err Duncan Hines. That cake looks delicious. Bet it goes good with beer too. Thanks for sharing. Debbie will see this and I may have to join you over on the BC or DH forum. Thumper Thanks for looking Give this one a go for sure, you wont be sorry you did. Thanks, I like everything but the Heath bar. That stuff's like tring to eat glass. Too hard. Troy, I would expect nothing less from you my Friend. The only thing missing is your durable DO table and DO for this one. The cake looks awesome no doubt about it. Nicely done my man. For what its worth Pappy I used to have that same problem on occasion, just put your teeth in and the crunch up them Heath bars. Pappy just put your teeth in and the crunch up them Heath bars. Maybe I could borrow your old pair!!! Were all brothers from another Mother here heck why not. Thanks Kevin, come back sometime and we'll give it a go! Tom, Ive been MIA on the Ring for a while, so sorry it has taken me so long to say thanks!